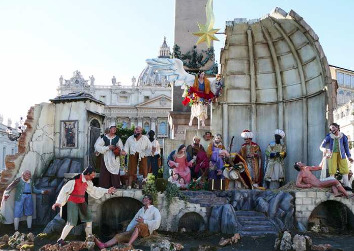 A stormy Christmas, this year at the Vatican. Just when Pope Francis, in his Christmas greetings to the curia, was going after those he called “traitors” and “opportunists” – after having already “delicately” fired the former and threatened to fire the latter – he was hit with sensational new own goals. At least three of them. The shrine of Montevergine, in fact, hosts an image of the Blessed Mother – reproduced in the nativity scene of Saint Peter’s Square – that was adopted some time ago as patroness by a vast LGBT community (lesbian, gay, bisexual, transexual), which once a year, on February 2, the feast of the presentation of Jesus at the temple, popularly called “Candlemas,” makes a festive climb of the sanctuary by foot, called “juta dei femminielli,” the climb of the effeminates. Seems like the Vatican is ruled under a Demonic Pope???? @gellerman55 and @flgranny33 are both right!!! We are indeed in another evil time. There are times of Revelation in church history. Pray!!!! And all types of Conservative and Traditional Catholics, Unite and lets win this already!!!!!!! When I read about things like this, first I feel heartsick, then I shudder. Last year I finished studying Revelations…I can’t help but think we are “there”, or perhaps “there” again. This is just the sort of reason for the vials being poured out.